Leftovers. I kind of love them. Making a meal of leftovers is usually an ad hoc exercise in cleaning out the fridge... a particularly prevalent activity among those of us with a not-let-anything-go-to-waste kind of mindset. Bits of this and that go into a scramble, get tossed into a soup, or scooped into a taco. There never seems to be enough of anything left over to actually stand on its own; too meager a morsel to plate as it might once have been plated. Not enough to go around to again be last night's dinner. And, thus, like chameleons, those bits, pieces and scraps are remade into something entirely different, ever adaptable to the change. It's a creative and spontaneous exercise. Oftentimes what you end up with remains a mystery until it's nearly done and on the plate. And sometimes you hit on something that becomes a meal you go to again... and again. Like these salmon cakes. And when you do it's really more of a set aside than a leftover. I suppose a set aside is what a leftover aspires to be. Because once you hit on something that works you actually plan that second meal along with the first, setting aside enough to ensure its creation. In other words... you buy extra. I make these salmon cakes (and other renditions like them) quite often. Sometimes they come about because I simply have some salmon left over. But, most often, it's because I intentionally over buy salmon... knowing these will be our reward. Of course you can simply cut to the chase and make these cakes straight away, but it's a lot more fun knowing you'll get two great meals from one planned effort. 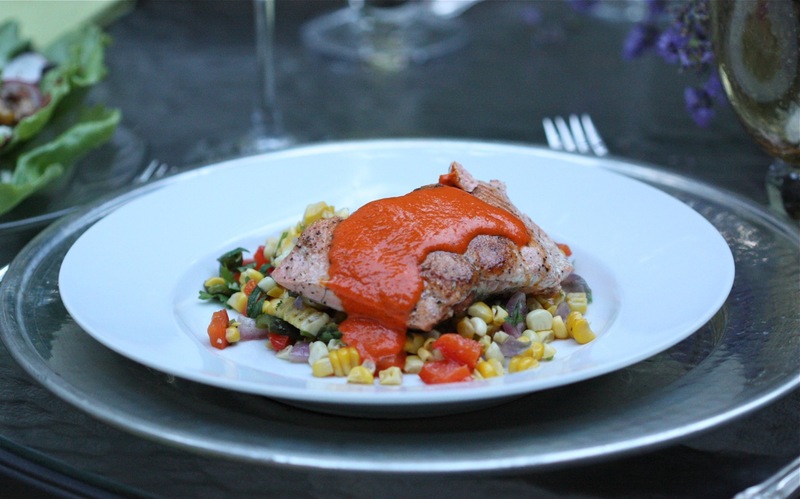 I started with a pan-seared salmon served over a roasted corn and pepper salad, topped with a roasted red pepper sauce. The extra salmon and corn salad from this meal was then set aside for salmon cakes. A quick chop of the salmon is tossed in with the corn salad, a bit of mashed potato, and an additional chop of cilantro. The patties are then coated with a touch of panko bread crumbs and pan fried for just a few minutes. Quick, easy and delicious... whether spontaneously created or deliberately planned. Mix salmon, corn salad, mashed potato, and cilantro until well combined. (I mashed my potatoes with a bit of unsalted butter and milk, and seasoned them with salt and pepper before adding to my salmon cake mixture). Then season with salt and pepper, to taste. Divide mixture into six and form patties. 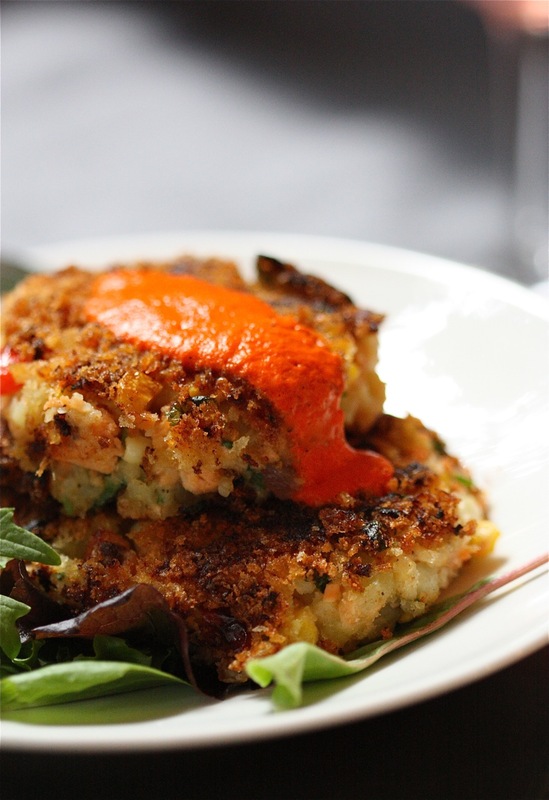 Delicately coat each patty with panko crumbs and lay in skillet. Cook for about 2 to 4 minutes to brown, then carefully turn each patty over and brown second side, cooking another 2 to 3 minutes. 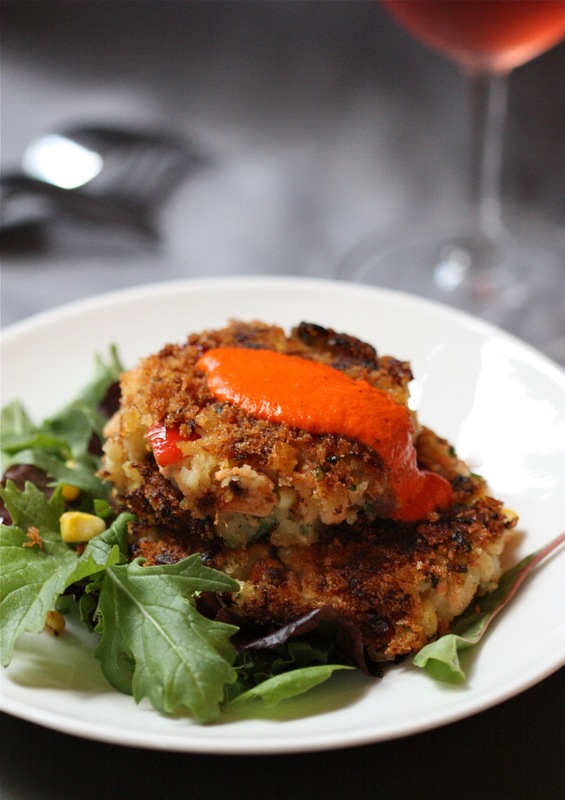 Place 1 to 2 patties atop a bed of mixed greens and top with a dollop of red pepper sauce. Serve immediately. Meanwhile, set oven to broil. Coat poblanos with just a teaspoon of olive oil and work into skin. Place peppers on a baking sheet and put under broiler for a few minutes, until skin begins to blister. Turn peppers over and continue roasting until skin is well blistered on opposite side. Remove peppers from oven and place into a brown bag to sweat. After 10 to 15 minutes, remove peppers and set aside to cool. Once cooled enough to handle, remove skin from peppers, cut away stems, and clean out seeds. Once cleaned, dice peppers and set aside. Place red onion and red bells peppers in a bowl, drizzle with remaining olive oil, and season with salt and pepper. Arrange veggies on a BBQ cooking sheet/pan and place on heated grill for approximately 15 to 20 minutes, tossing intermittently, until slightly charred and cooked through. Cut corn kernels from cobs; dice onions and all peppers. Combine veggies with cilantro and season with salt and pepper, to taste.